This pendant and earrings set is just lovely. 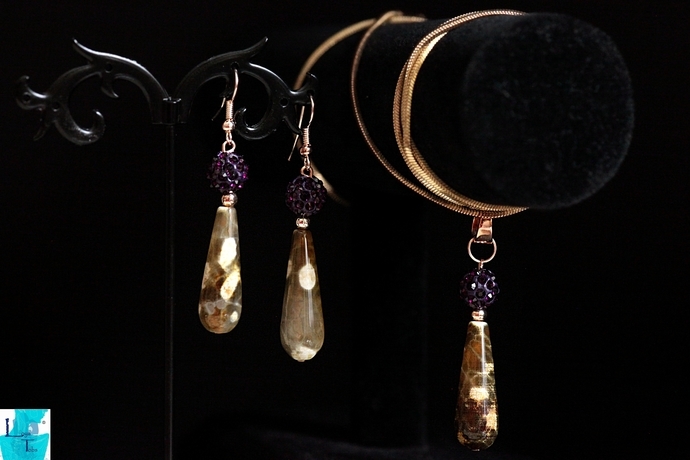 They are made with Fire Agate Tear Drops in shades of brown with beautiful markings. A deep reddish purple shamballa bead atop the fire agate seems to spit fire in the glare of light. Fire Agate, known as the spiritual flame of absolute perfection, carries a great mystery locked inside its deep brown crystal. Fire Agate is a variety of Chalcedony, a mineral of the Quartz family. It has a translucent deep reddish-brown base, with flashes of orange, red, green and gold that appears as living flames within the gem. Its iridescent colours are caused by light interference on thin layers of iron oxide or limonite crystals within the Chalcedony. A very beautiful and mature set. * 30 x 10mm Fire Agate Tear Drop beads. * 10mm reddish purple Shamballa ball. * Rose Gold plated pendant bail. * Rose Gold plated brass ear wires. * Earring is 2inches from bottom of ear wire. * Pendant is 2.5 inches in length from top of bail. These items can be bought individually.